Extra gum is for real. The ads say the flavor lasts a long time and it totally does. Believe me, I'm a MAJOR gum chewer while I'm lifeguarding. And I have very little patience for flavorless gum. They have these crazy flavors that sound disgusting and they're completely delicious. Apple Pie. So nasty sounding but SO good. Strawberry Shortcake. Doesn't taste anything like you think it will. Watermelon is a normal flavor. Usually not a watermelon person, but this stuff is awesome. Next time you're staring at the wall of gum in the store... you'll know which ones to pick. I've always wanted to try those dessert-ish flavors, but I thought they'd be disgusting. Now maybe I'll have to try them! I love the mint Chocolaye chip one! Yum! That's crazy, I just got the strawberry shortcake one and was a little nervous about it. But I definitely am going to have to try it asap now! I've always been hesitant about these dessert flavors, but I may have to give in and try one next time! 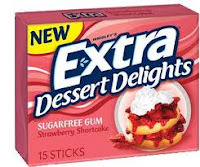 Ok, the first one does sound pretty disgusting, but I'm a huge gum fan so I'll have to give it a try! Apple pie? ARE YOU SERIOUS?!?!?!?!?!?!?!?!!!!!!!!!!!!!!!! I don't think we have these sort of flavours over here! I love the sound of apple pie flavour though- much better than mint! I wish I could chew gum without it ruining my jaw! 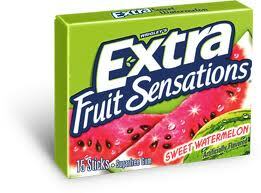 I rarely chew gum but my husband does all the time and he loves Extra. 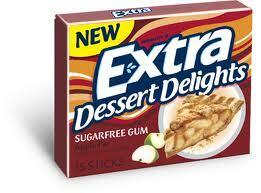 i hate apple pie, but i LOVE this gum!!! so so much! I love this gum so much!! !